Over the past century, and acceleratedly so during recent decades, visuality has become pervasive in all aspects of life due to the proliferation of media based communication devices which can be observed to have a strong basis in visuality. Thus the mission of the VACD program is to provide the student with an in-depth understanding of visuality and its applications to the domains of Visual Art and Visual Communication Design. 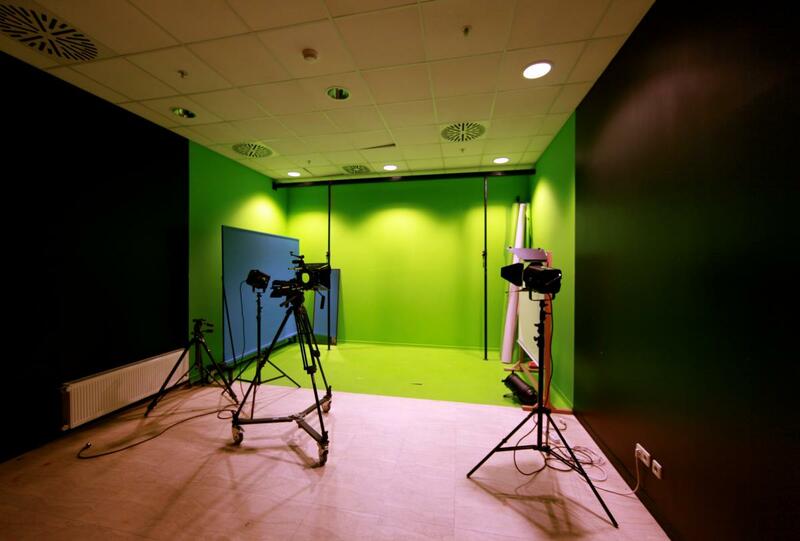 However, our efforts go beyond a sole understanding / application of the visual fields themselves in that we also seek to bring about their integration with other creative output such as sound design, new media output and temporally based works implemented through the diversified building blocks of our curriculum. Obtaining the Master of Art degree of the VAVCD program at Sabancı University involves a rigorous study which combines studio work in art and design study related to these fields, and which form the two main tracks of the program. Thesis degree requirement is a fully articulated art or design project or with a written theoretical dissertation which revolves around a cohesive query, concept or topic that can be applied to at least one of the two areas of investigation of the program, and which as a finalized product is expected to be presented to a jury at the end of studies.Non-Thesis degree requirement is a fully articulated art or design project which revolves around a cohesive query, concept or topic that can be applied to at least one of the two areas of investigation of the program, and which as a finalized product is expected to be presented to a project supervisor at the end of studies.While students may choose to remain solely within any of the two main tracks indicated above, due to the increased nature of hybridization in the overall field of art, design and related theory we also make provisions for hybrid projects/written theses which spread themselves out over two or more of these fields, or combine the expertise and methodologies of them into novel outcomes which reside at their intersections.Our faculty is comprised of a strongly committed group of individuals, whose output and recognition well extends into the international arena of art, design and theory; and a significant number of whom can profess to hybrid expertise and interest areas that lie at the convergence points of several related, but nonetheless distinct, fields. In the expandable/collapsible listings below you will find an overview of our individual areas of proficiency, our work media, and the creative/research topics as well as the theoretical areas which especially interest us or relate to us. Please navigate through them in order to find out more about us and the educational opportunities of our program. Graduate admission deadline is May 31, 2019. 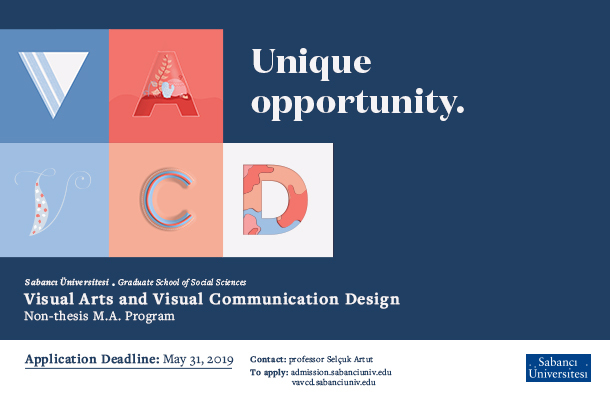 For 2019-2020 academic year, you can apply for non thesis track of Visual Arts and Visual Communication Design Program. The interdisciplinary educational approach embraced by Sabancı University aims to provide an ideal breeding ground for the education of the "new" artist and designer. The program offers two different tracks, namely Visual Arts where the aim is the education of visual arts and Visual Communication Design where the aim is the education of interdisciplinary audio-visual communication designers. For further information about Visual Arts and Visual Communication Design Undergraduate Program, please contact Program Coordinator Selçuk ARTUT (sartut@sabanciuniv.edu). Graduates of the VAVCD program have a wide range of career opportunities. With the interdisciplinary education that they receive during the four years of study, our students are equipped with a great variety of skills and knowledge to work in different fields. Our graduates have been employed as artists, designers, curators, art directors, film directors, communication advisors, fashion designers, journalists, brand managers, editors, social media experts, multimedia designers, technology consultants, academicians and more. They continue their careers at companies like Google, Fjord, Voden, TBWA, Alameti Farika etc. Program Requirements may vary according to the year of first enrollment. Please click below to see the program requirements for new students. In an environment full of the opportunities presented by the influence of the European Union, our students are enjoying the possibility of attending exchange programs abroad. To enable our students which such opportunities, contracts have been signed between our university and various universities in Europe. To date, many of our students have participated in these programs, including different disciplines, different contents and duration. Consequently, foreign students are also welcome to study at Sabancı University and such programs are indeed in the progress of being further developed. Our program provides students with extensive use of spaces and technologies compliant with the updated approaches in art and design making. Question: Do you apply talent exam for the admissions? Question: What is the difference between Visual Arts and Visual Communication Design Programme? VAVCD: Visual Arts focuses extensively on the study of arts, whereas Visual Communication Design focuses on design issues mainly structured on computer-aided design systems. Question: Am I allowed to take VA401 and VA402 in the same semester? VAVCD: Students are allowed to enroll VA401 and VA402 courses together given that they have the opportunity to fulfill their graduation requirements in the same semester. For registration, they can apply to the Dean of FASS with a petition with the approval of the faculty member they will be working with before the course registration. Question: May I learn about the Fees and Admission Procedures? VAVCD: No, We do not apply any talent exam. Question: Is there a standard form of how should the portfolio be presented? VAVCD: The portfolio needs to contain shortlisted work samples that reflect the applicant's talent in the field. Question: Are we expected to have a degree in Visual Arts or Visual Communication Design to apply for the program? VAVCD: You are not required to have a degree in Visual Arts or Visual Communication Design, however, it is preferred that you have a degree from a related field. Question: I am a Non-thesis Track Student, when should I register to VA 597 Term Project? VAVCD: You should register in your last semester. Question: What is the maximum duration of study if I am a Non-Thesis MA Student? VAVCD: You are required to accomplish succeeding all the courses including your graduation project at the end of the third semester. Question: What is the language of teaching? In honor of the late Sakıp Sabancı, Honorary Chairman of the Board of Trustees of Sabancı University, the “Sakıp Sabancı International Research Awards” were presented at a ceremony hosted by the Sakıp Sabancı Family and Sabancı University on Wednesday, April 10, 2019 at the Sabancı Center.